I've never considered myself an ornament collector. Heck, I collect action figures! 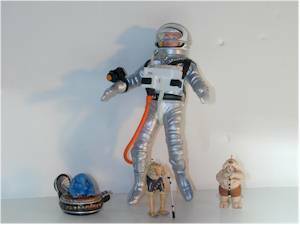 And then I happened to be perusing my toy room, and noticed that there seemed to be quite a few ornaments hanging around. I was shocked to count over three dozen hanging from various spots, and hidden on multiple shelves! How did this happen? It's all the fault of companies like Hallmark and Carlton. In recent years, they've increased the number of licensed characters they are using in their ornaments, and now they cover a broad spectrum of cartoons, super heroes, and various classic toys. Superheroes have been popular for some time. Superman and Batman themed ornaments are my favorite, but Marvel characters like Spiderman have been well represented too. With the demise of the WB stores, we probably won't see quite as many cool animated Batman and Superman ornaments this year, but hopefully someone will pick up the slack. One of the unique things about the DC based ornaments is the wide diversity of timelines covered. Silver age and modern age, animated and classic, there's something for just about everyone. 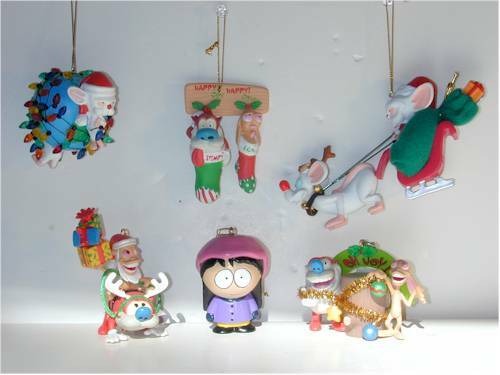 Another hugely popular theme for Christmas ornaments are cartoons. Above you can see various Ren and Stimpy, Pinky and the Brain and even South Park ornaments. Obviously kids love cartoons, and Christmas is all about kids, so the connection is obvious. The Warner Brothers ornaments are some of the best produced, surpassing Hallmark and Carlton for quality. Cloth and various types of plastic are used to offset the basic resin material, and the designs are always exceptional. Enesco, makers of the Precious Moments figurines, also produce various ornaments. One of the finest lines was the Rudolph the Red Nosed Reindeer set they did a couple years ago. This year marks the fourth year that Carlton is doing the Simpsons license, and the ornaments have improved each year. 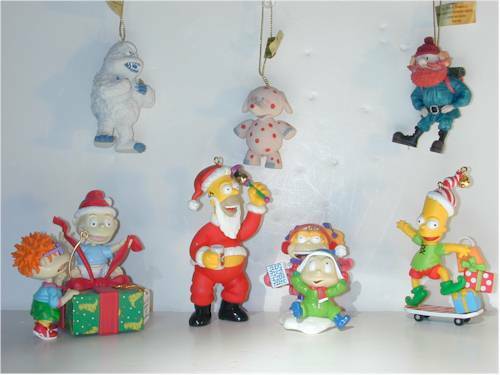 My favorite is still the Santa Homer, though, and he's the only Christmas ornament I've ever seen carrying a beer. Hallmark has been handling the Star Wars license for several years, along with the Star Trek license. 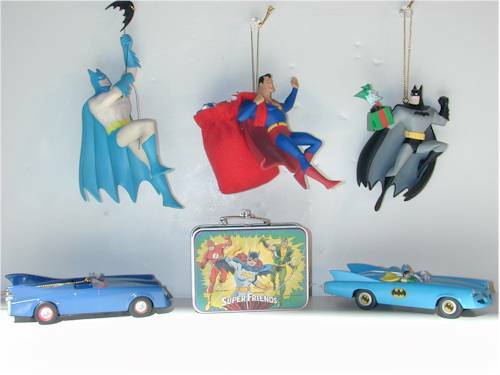 These ornaments have been tremendously popular with collectors of both franchises. Hallmark has also been doing various classic toy lines as ornaments, like G.I. Joe, Barbie, and Hot Wheels. No matter what you like, there seems to be an ornament to go along with it. If you're a collector of action figures, cartoon characters, or other toys, I'd suggest checking out your local Hallmark, Carlton and gift shops. You might be surprised at what you find! Start shopping now, because most of the stores start releasing their ornaments by August.